Summary: Fall weather has arrived! Slight rain chances through Saturday night. Temps on their way down before rebounding some this weekend. Apple Butter Fest forecast. 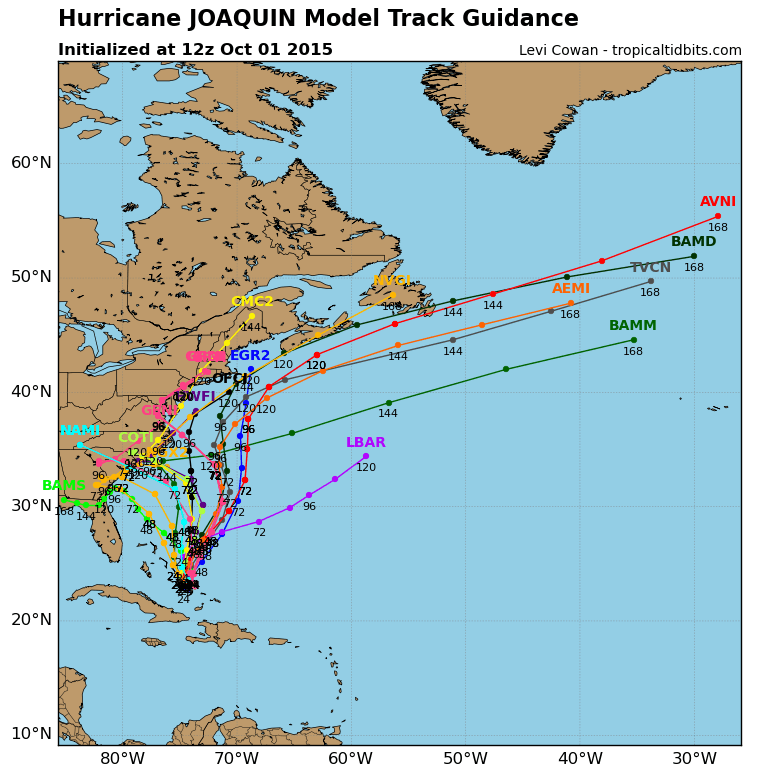 Will we see any of Hurricane Joaquin? Whew! We have a lot to cover in this post today, but thankfully no severe weather! Yesterday we got our first really good taste of fall weather, just in time to usher in October. Even though the meteorological fall started September 1st and the autumn equinox on September 23rd, it hasn’t really felt like it until now (at least for me!). Today, we’ve got a 20% chance of rain as our high temperature will climb to about 68 degrees. The winds, however, are blowing out of the north at 10-15 mph, with some gusts up to 20 mph. This northern wind will make it feel less than 68 degrees, so a jacket may be necessary. 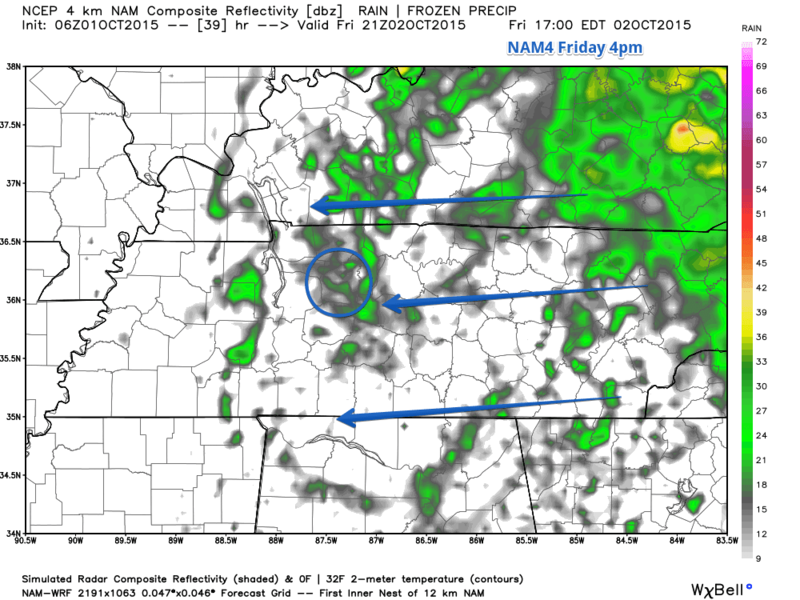 Here’s what HRRR thinks we could see for rain. Very spotty stuff today. The loop runs from 8am through 10pm Thursday. 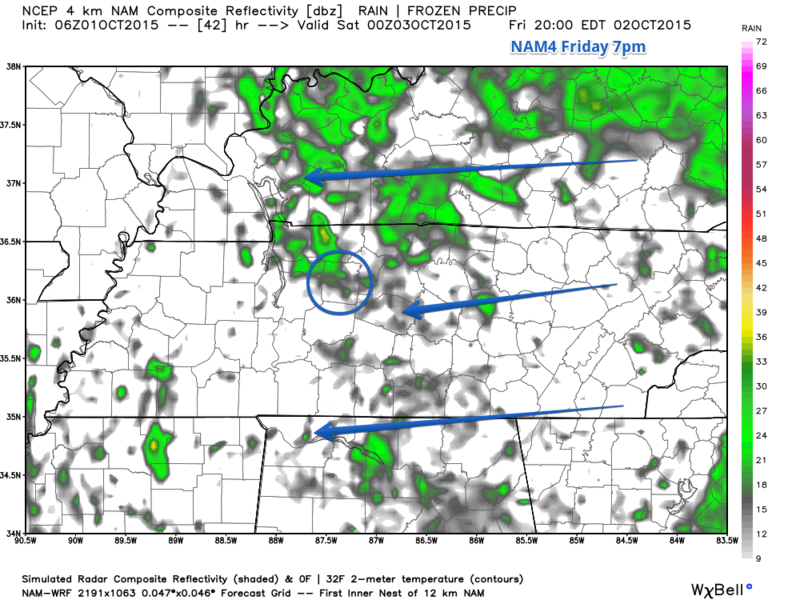 The NAM4 model doesn’t quite disagree with HRRR, depicting more rain mainly at sunset and after. 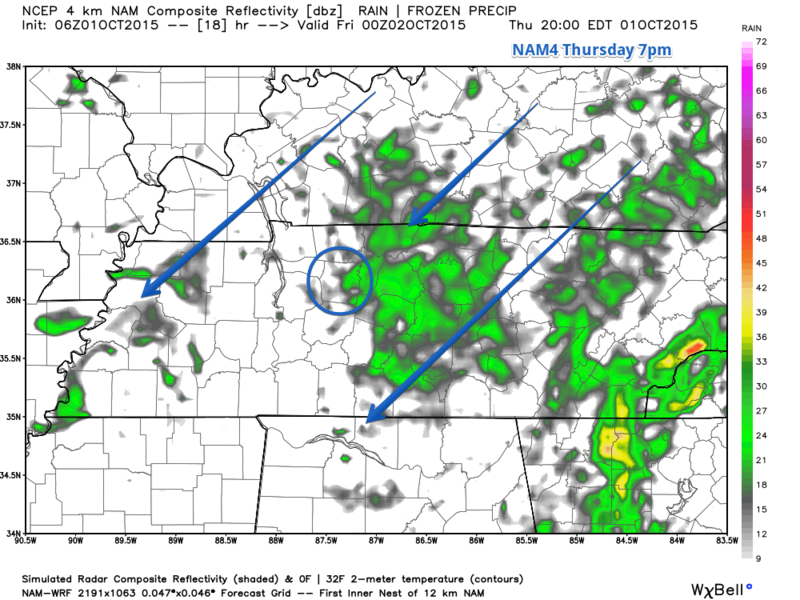 Here’s the NAM4 look at 7pm tonight. They likely disagree because of the cold front that pushed through yesterday, of which brought less humid air. This less humid air is mixed in with today’s rain chances leaving us drizzle for rain instead of downpours, and it’s likely having a hard time deciding what’s going to be drizzle and what’s not. It does appear that the chance for drizzly rain is more tonight than during the day. Friday will see a 30% chance of rain as the temperature takes even more of a dive and not reach more than about 62 degrees. Those winds will still be out of the north at 10 to 15 mph, so it is going to feel every bit of 62 degrees or even upper 50’s. NAM4 is painting this big rain glob that will slowly move from east to west overnight, not not sure just how far west it will move. 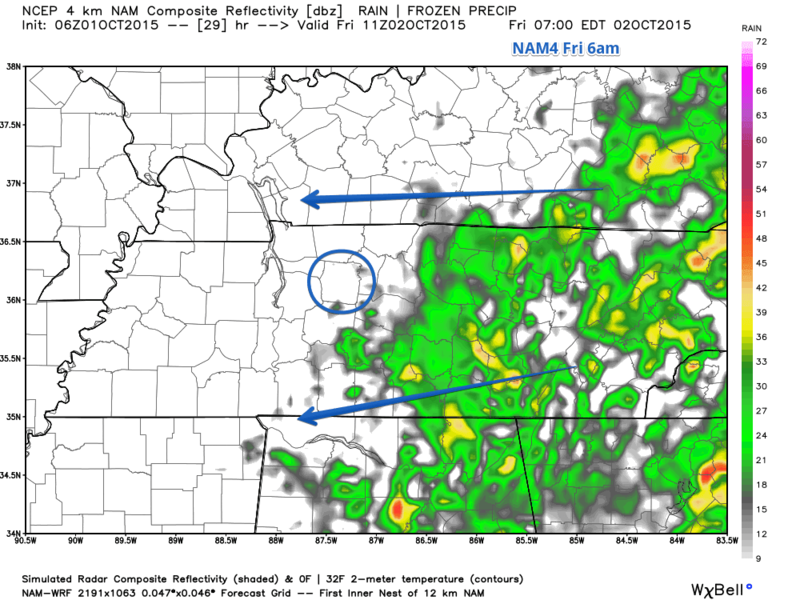 Here’s the NAM4 at 6am Friday morning, showing the rain glob the closest to us. Weather models can change, so this glob could move closer to us or further away, but it is safe to say that any rain we do see will be legit rain, not drizzle. Rain chances increase as we move through the day, especially around 3pm and onward. Here’s NAM4 at 4pm. Friday night football games looks like it could be on and off wet. Here’s NAM4 at 7pm when high school football games kick off. The Apple Butter Fest is this Saturday in White Bluff You can read more about it and get more info here. Saturday will be much of a repeat of Friday with our high temperature barely reaching 62 degrees and those north winds persistent at 10 to 15 mph with gusts up to 20 mph. If you are going to the Fest wear warm clothes! Our rain chances will be 20% on Saturday. The NAM4 isn’t really showing too much rain for the Fest during the day, so Fest goers may stay mostly dry. The low center that is sending all of this rain toward us will start marching onward and taking the rain with it. We’ll give you more info on this tomorrow when NAM4 gets better in range. Sunday looks to be a much better day for outdoor activities, as we have no rain chances and temperatures rebound a bit to about 71 degrees under partly sunny skies. Those northern winds die down too being only 5 to 10 mph. We’ve got one eyeball on Hurricane Joaquin this morning. As of this writing it is a Category 3 hurricane bearing down on the Bahamas this morning. Currently NOAA believes the Joaquin will turn north and make US landfall somewhere around New Jersey in the very early morning hours of Tuesday as a Tropical Storm. At least that is the general consensus. ALL weather models change and since this storm ramped up to a Hurricane 3 status in a matter of a couple of days, it could really go anywhere, with some models agree with the above path. Below are all the different models and where they think Joaquin could go. It doesn’t look like it could have any impact for us, but if the BAMS (lime green) or NAMI (bright blue) models are to be believed, then we might see a rain drop. But it really too early to say for sure.